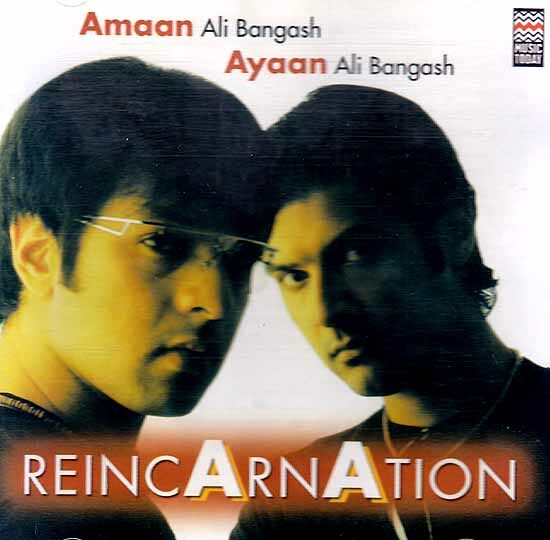 Reincarnation was conceptualized around a year back. For a very long time now both of us really wanted to make out debuts into the new age music world. However coming form a very traditional background and having a father of the statue of Amjad Ali Khan Needed us to establish ourselves first for what we are and that is classical music. A time came in out careers when we decided to nurture our other side. This led to the birth of Reincarnation. While giving all due respect to tradition and maintaining the purity of each raga every track has grown like a newborn child with strong characteristics of its won. Sound is heard here as never in the past. As savvy as this album may sound it also has compositions of our grand father and our father in a few tracks. This is also the first time we are lending out vocal chords for an album. Its strange we never imagined that we would record ourselves that too for a project of this nature! Reincarnation rebirth and reincarnation has intrigued man. As a human being reincarnates so does music as music is a living entity in itself. For us all tracks in this album are a reincarnation of what they have been since thousands of years. We’d like to extend our gratitude to Sawan Dutta for the most superb programming Ashish Manchanda for the brilliant mastering gurmeet Singh, Mannu Kohli and everyone at Music today and lastly. Maa and Abba for their faith and belief in us. A young talent of the 7th generation in an unbroken chain of the Senia Bangash School, Amaan Ali Bangash is the elder son and disciple of the Sarod maestro Amjad Ali Khan and grandson of Haafiz Ali Khan. Initiated into the fine art of Sarod playing at a very tender age Amaan Began his public performances as early as eight. Accompanying his father to various music festivals in India and abroad he has today carved out a niche for himself. His performances have evoked creditable applause. His precision in tunefulness and his bold and resonant strokes are all pointers to importance of tradition and continuity in Indian classical music. Ayaan Ali Bangash represents the seventh generation of a musical lineage known as the Senia Bangash School. The younger son and disciple of the Sarod titan Amjad Ali Khan, Ayaan stepped into the world of music and Sarod with confidence, clarity, consistency and technical mastery that he learnt at his father’s knee. After giving his solo debut at eight, Ayaan has been performing concerts world wide ever since. He has given many solo performances and also assisted his illustrious father at concerts all over the world. Ayaan has won the hearts of music lovers both in India and around the globe. He made his UK Debut in 1989 and the US Debut in 1991 at the Asia Society in New York and performed at St. James Palace in July 1997 for the Temenos academy.